It’s common in the Amish community to pass furniture on from generation to generation, creating family heirlooms. That means choosing the perfect hutch for your family is about more than just choosing a piece that works well with your current décor. It’s also about choosing a timeless piece that will transition well from your house to the house of your children one day. That’s why your hutch should be an Amish Heirloom Hutch. Built to last, Amish Heirloom Hutches are timeless in both design and construction for a beautiful piece of furniture your family will enjoy for generations. Everything in your home should be a direct representation of your own personal style and taste. It should be a reflection of yourself, from your furniture to your décor and everything in between. That’s why our solid wood Heirloom Hutches are available for purchase in Hickory, Maple, Cherry and Oak. This design allows them to be mixed and matched together with the rest of your AmishOutletStore.com furniture and décor for a unique and personal look in your home. Whether you want your room to be rustic themed, a traditional space or a mixture of modern and classical pieces, these hutches are the perfect addition to make your dream home come to life. Pair it with subdued natural colors and other wooden or stone pieces to create a rustic escape. Decorate with gold, copper or wrought iron pieces to give your room a more traditional and classic look. If you prefer mixing the natural world together with the industrial world, try adding in a few edgy mirrors, metal fixtures and modern art pieces to your space along with your Heirloom Hutch to perfectly blend two worlds together. 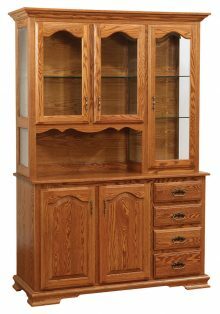 You do not need a lot of space in your home to enjoy an Amish Heirloom Hutch. With different sizes and functionalities available, you are sure to find something that fits both your style and your home. The Brookside 2-Door Hutch and the Heritage 2-Door Hutch are both perfect for smaller spaces. 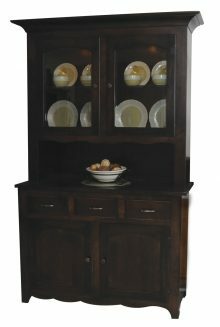 The Hampton Frontier Hutch is also a great space-saving choice that not only offers you the storage and elegance of a traditional hutch, but also has a hideaway table built right in for convenience, practicality and functionality. Don’t let small spaces stand in the way of you adorning your house with a few of the best quality handcrafted solid wood heirloom hutches available. Also, don’t make the mistake of thinking your hutch can only be used for holding fine china. 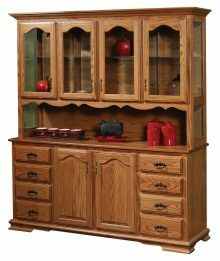 Use your new hutch in any room of the house for any number of things. Use it to display your collection of porcelain figurines, sports memorabilia or even as extra kitchen storage for everyday items. 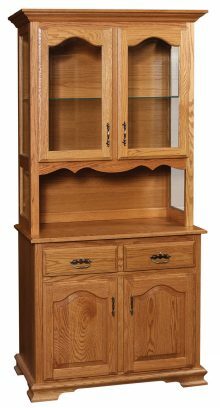 Rather than spending your hard-earned money on another mass-produced piece of furniture that may last your family a few years, order the only hutch you will ever need from us and know it will last your family for generations. 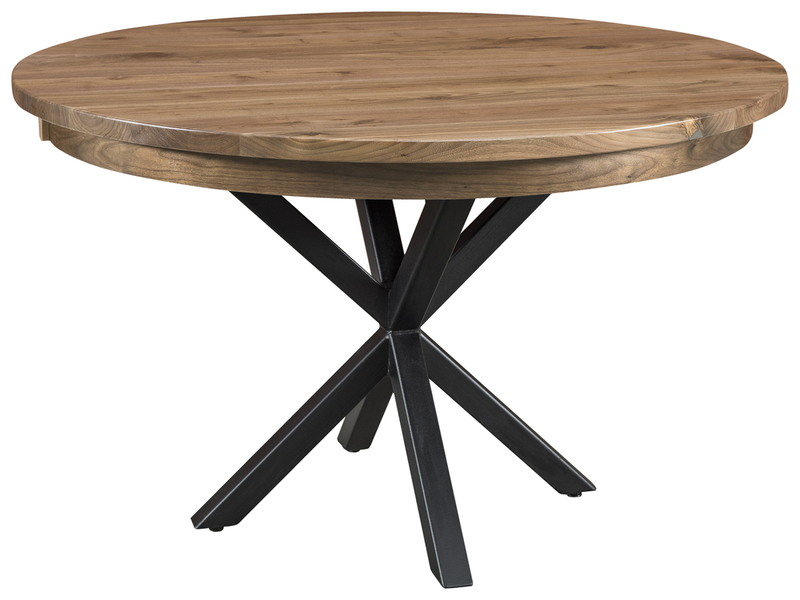 The sturdy design, impeccable artisanship and natural woods used all come together to create a durable and long-lasting piece of furniture that will stand up against everyday wear and tear without letting you down. 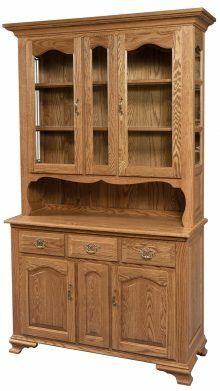 If you are looking for high-quality Amish furniture at low prices, you’ve come to the right place. Purchase any of our solid wood Heirloom Hutches right now and get up to 33% off the regular retail price. You will love doing business with us, as we are a small-town company that still adheres to old-fashioned values of honesty, courtesy and respect. Our friendly customer service representatives are always eager to lend a helping hand whenever you need it. 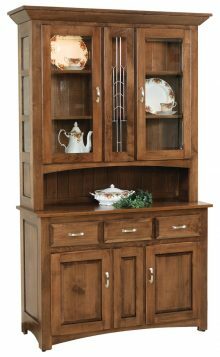 Explore our beautiful solid wood Heirloom Hutch collection right now!